Captained by George Vancouver, the HMS Discovery led a four and half year circumnavigation of the globe between 1791 and 1795 dubbed “The Vancouver Expedition”. Sailing east from England, the Discovery explored Australia and New Zealand, stopped in Hawaii, then crossed the Pacific and in 1792 made landfall in Birch Bay, Washington. Over the ensuing weeks, Captain Vancouver employed two small yawls to explore the waterways of the Salish Sea. On the morning of June 13, 1792, he and his sailors entered what they would later call Burrard Inlet, and just east of the First Narrows, the first meeting between European and Coast Salish people occurred. Long after the Vancouver Expedition, the HMS Discovery was decommissioned as a naval vessel and repurposed as a hospital ship and afterwards as a prison hulk. The ship was permanently moored on the Thames River, first at Woolwich, then in 1824 at Deptford, where it stayed until finally being broken up for scrap. Myfanwy MacLeod’s scale model of the HMS Discovery portrays the ship during these latter years, after two extra levels were built onto its deck in order to house the City of London’s rising convict population. 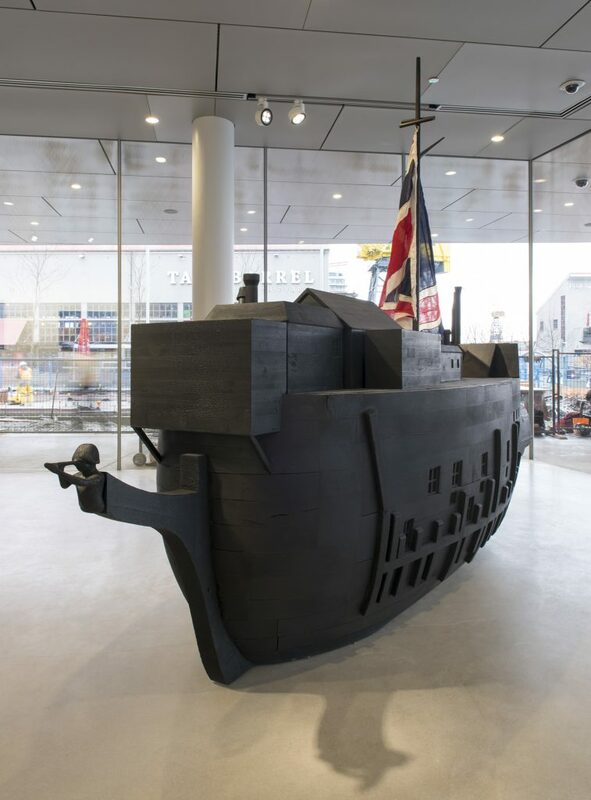 Constructed in wood, the model is finished using the technique of Shou Sugi Ban (charring), invented in Japan in the eighteenth century as a method of preservation. Myfanwy MacLeod (b. 1961, London, ON) is an artist based in Vancouver. She exposes the overlapping and intersecting of pop culture, art history, and folk tradition. MacLeod draws parallels between how art and mass media are created, circulated, and consumed, articulating her findings with satirical wit. Her works, which range from photography and painting to largescale installations and sculpture, examine how context and discourse can transform images, objects, or sounds, changing the way they resonate with individuals and in society. The Butcher’s Apron, by Myfanwy MacLeod, is the first in a 10-year commissioning programme sponsored by The Burrard Arts Foundation (BAF). Once per year, a commission will be awarded to an artist to produce a work for exhibition on the ground floor of The Polygon Gallery.